Lineage. 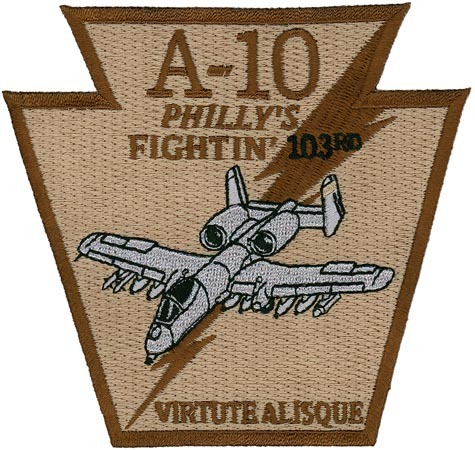 Activated in Pennsylvania NG as 103 Observation Squadron. 103 OS extended federal recognition on 27 Jun 1924. Redesignated 103 Observation Squadron (Medium) on 13 Jan 1942; 103 Observation Squadron on 4 Jul 1942; 103 Reconnaissance Squadron (Fighter) on 2 Apr 1943; 103 Tactical Reconnaissance Squadron on 11 Aug 1943; 40 Photographic Reconnaissance Squadron on 21 Oct 1943; Inactivated on 2 Nov 1945. Redesignated 103 Bombardment Squadron and allotted to Pennsylvania NG on 24 May 1946. Redesignated 103 Bombardment Squadron (Light) and extended federal recognition on 20 Dec 1948; Redesignated 103 Strategic Reconnaissance Squadron on 1 Apr 1951; 103 Fighter Bomber Squadron on 1 Jan 1953; 103 Fighter Interceptor Squadron on 1 Jul 1955; 103 Air Transport Squadron (Heavy) on 1 Apr 1962; 103 Military Airlift Squadron on 1 Jan 1966; 103 Tactical Air Support Squadron on 27 May 1969; 103 Fighter Squadron on 15 Mar 1992. Deactivated 31 Mar 2011. Assignments. Pennsylvania National Guard , 28 Division, PA NG, 27 Jun 1924; II Army Corps, 17 Feb 1941; 59 Observation Group, 1 Sep 1941; 26 Observation (later Reconnaissance; Tactical Reconnaissance) Group, 18 Oct 1942; III Reconnaissance Command, 21 Oct 1943; I (later III) Tactical Air Division, 18 Apr 1944; AAF, India-Burma Sector, 3 Jun 1944; Tenth Air Force, 5 Jul 1944; 8 Photographic (later Reconnaissance) Group, 18 Jul 1944-2 November 1945; PA ANG, 10 Dec 1948; 111 Air Transport Group, 1 Apr 1962; 111 Tactical Air Support Group, 27 May 1969; 111 Fighter Group, 15 Mar 1992-31 Mar 2011. Stations. Philadelphia Airport, PA, 27 Jun 1924; Olmsted AAF, PA, 27 Feb 1941; Hillsgrove AAF, RI, 23 Dec 1941; Hyannis Airport, MA, 9 Jun 1942; Ft Devens AAF, MA 20 Aug 1942; Reading AAF, PA, 8 Jun 1943; Birmingham AAF, AL, 20 November 1943; Will Rogers Field, OK, 11 Feb-11 May 1944; Guskhara, India, 10 Jul 1944; Alipore, India, 9 Aug 1944; Detachment at Cox’s Bazar, India, after c. 10 Dec 1944; Cox’s Bazar, India, 18 Jan 1945; Akyab, Burma, 14 Feb 1945; Alipore, India, C. 15 May 1945; Kanchrapara, India, Sep–c. 4 Oct 1945; Camp Kilmer, NJ, 1–2 Nov 1945; Philadelphia IAP, PA. 1946-1963; NAS Willow Grove, PA. 1963-31 Mar 2011. Operations. Emergency operations while under state control included flood-relief in Pennsylvania, 19–22 March 1936. Antisubmarine patrols, 27 December 1941-19 August 1942; combat in CBI, 6 September 1944-10 May 1945. Ordered to active service as part of the Korean War call-up, 10 Oct 1950-15 Nov 1952. Air defense of northeast US, 1953-1962. Transport of troops and cargo all over the world. Flew in support of the Vietnam War. Airborne Forward Air Control from 1969 and added Combat Search and Rescue with the arrival of the A-10. Participated in Operation Southern Watch in 1995 and 1999, flying Combat Search and Rescue alert, Kill Box flights over Iraq, Airborne Forward Air Control and joint training missions over Kuwait. Deployed back to Al Jaber AB to support joint combat flight operations for Operation Southern Watch over Iraq and Operation Enduring Freedom over Afghanistan in support of the Global War on Terrorism in 2001. Lead unit for AEF deployment to Bagram AB, Afghanistan, Oct 2002-Jan 2003. Deployed in support of Operation Iraqi Freedom, Feb-May 2003. Campaign Streamers. Antisubmarine, American Theater; India-Burma, Central Burma. Emblem. Approved on 10 Apr 1931.